Open four door phaeton with folding cloth roof. The body of the car is painted a teal with black fenders. The spokes on the wheels are yellow. There are two spare tires mounted on either side of the hood. The front and rear bench seats have new leather upholstery. In the center of the chrome radiator shell is a blue plaque stating "Ford." The headlights are mounted on either side of the hood. When Stephen Phillips graduated from Harvard in 1929, he and four friends took a road trip from Vancouver to Colorado. The boys lived out of Hosmer Norris' 1929 Model A Ford. 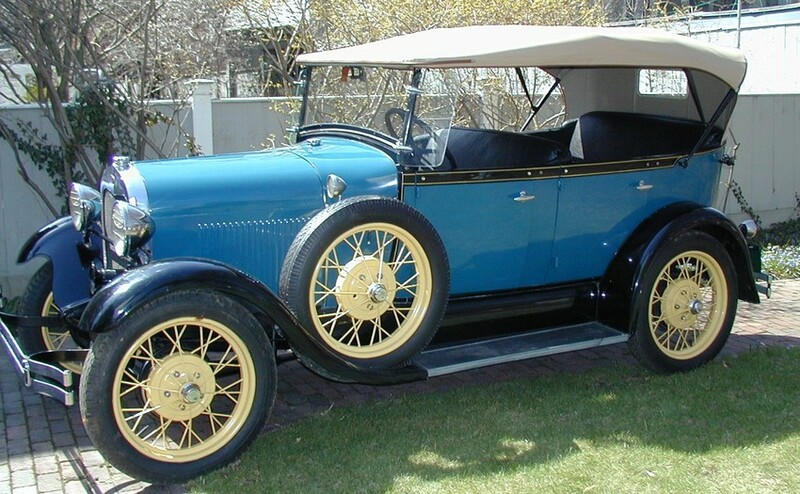 Stephen and his wife Betty purchased this 1929 Model A Ford in 1942 and it was likely used for pleasure drives with the family. It is currently on display at the Phillips House in Salem, Massachusetts.